You like Apple right? You like Apple’s iTunes stores, be they for apps, music, TV shows or video, right? Of course you do, and to get your hands on all that juicy content then you’ll need money, be that of the flexible friend kind or iTunes gift cards. With Christmas around the corner iTunes gift cards are an awesome gift for the Apple fan in your life, and as we are all trying to spend as little as possible these days, deals are always welcome. 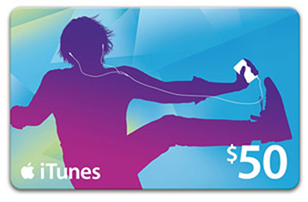 That’s why when Walmart is offering $50-worth of iTunes vouchers for $40, it is worth taking notice. Give the gift of one-stop entertainment. Each card features an iTunes Store code redeemable for music, movies, TV shows, audiobooks, games, and more. Recipients can sync to their iPod, iPad, or iPhone. iTunes Gift Cards are not returnable. But we are getting closer and closer to Christmas, you say. What if they don’t arrive in the mail? Well, that’s the best part! If you decide to take Walmart up on their offer of $50-worth of iTunes credit for $40 then the nice people will email you the codes, meaning you don’t need to worry about those pesky postal problems that always creep up at this time of year. So, head on over to Walmart and fill your boots, if you’re a app-aholic these cards have to be worth a punt! Note: This iTunes gift card will be valid for US iTunes Store only.